This morning, cricket fans woke up with a bad news of Anil Kumble has stepped down as coach of the Indian cricket team. The former skipper has reportedly decided not to accompany the Indian team to the West Indies for a limited-overs series starting June 23, citing his commitment to an ICC meeting. However, no official reason has been stated by the former skipper but Rumours of a rift between Indian skipper Kohli and Kumble were reported to be behind him throwing out the position. Reportedly, Kumble has sent his resignation to BCCI CEO and former India greats Tendulkar, Ganguly and Laxman have been considered as fresh applications to take up the position as a coach. Anil Kumble’s original contract expired at the end of the Champions Trophy on Sunday with former cricketer giving his post on Tuesday. Anil Kumble took to twitter to share the news to his fans and everyone. He also added in the post saying he was surprised by Kohli’s reservations over his style of coaching. “…it was apparent that the partnership was untenable, and I therefore believe it is best for me to move on,” the 46-year-old Kumble wrote in a Twitter message posted on Tuesday. Virender Sehwag ,Tom Moody, Richard Pybus, Lalchand Rajput and Dodda Ganesh have applied for the job to refill Kumble’s place. 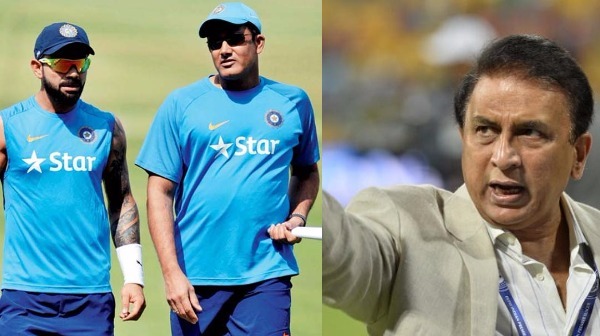 Commentator as well former Indian cricket team captain Sunil Gavaskar reacted on Kumble’s awful resignation from team India’s coach. Sunil Gavaskar slammed Virat Kohli and his team after Anil Kumbl’es resignation from the post. Olympics gold medalist ace-shooter Abhinav Bindra too took a sly dig at Virat Kohli after Anil Kumble stepped down from Indian team coach. He did not mention anyone’s name but the tweet was enough to understand what he meant and whom it was gestured to. With too many conspiracies, it will now be interesting to see who takes over the mantle. Previous : Selfie Time – This Pic Of Shahid Kapoor With Wife Mira Rajput Is So Lovable! Next : Bipasha Basu Shares Some Lovey-Dovey Yoga Poses With Karan Singh Grover On International Yoga Day!